UMD Head Coach Maura Crowell said her team has been able to rise to the occasion against its toughest competition this season. Photo by Alex Ganeev. 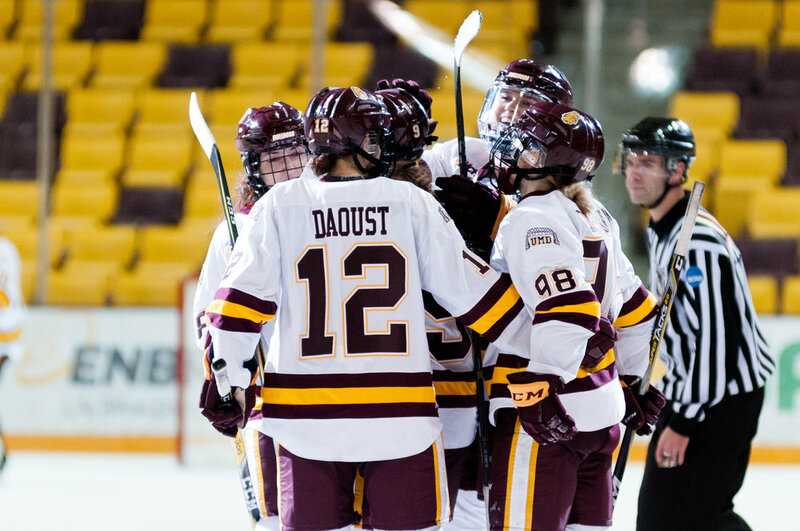 With a record of 12-13-2, the UMD women’s hockey team is going through an up and down season, but the team is currently playing some of its best hockey with a 3-1-1 record in its last five games. The Bulldogs recently played in the first NCAA D-1 outdoor hockey game in the 12-year history of Hockey Day Minnesota, a 1-1 tie with St. Cloud State. UMD Head Coach Maura Crowell was excited about the opportunity for her team to play outdoors in front of a large television audience. Eleven current members of the UMD women’s hockey team come from Minnesota and grew up watching Hockey Day Minnesota and playing at outdoor rinks. Crowell said that she reminded her players about growing up playing outdoor hockey as children, and the team responded by firing 44 shots and dominating puck possession. Despite outshooting the Huskies 44-17 and controlling faceoffs and puck possession, the Bulldogs were only able to put up one goal during their Hockey Day Minnesota matchup against the Huskies. With difficult games against Ohio State and Wisconsin approaching, Crowell said that she had placed an emphasis on smart shot selection. UMD returned to indoor hockey at Amsoil Arena on Jan. 26 and 27 to sweep fifth-ranked Ohio State, outscoring the Buckeyes 6-2 in the two-game weekend series. The team has shown a knack for playing well against tough competition, beating fourth-ranked Colgate and tying seventh-ranked Minnesota on the road earlier in the season. Crowell said that the team’s underdog mentality has helped them play their best in the biggest games. The Bulldogs will get a rematch with the Huskies at St. Cloud State on Wednesday, Jan. 31 at 6:07 p.m. The Bulldogs carry a 2-1-1 record against the Huskies on the season, with both wins coming at Amsoil Arena.